Currently the channel with most subscribers has 65119648 subscribers. Probably you didn't read the number easily, so an abbreviation like 65M or 6511K would be easier to read isn't? A lot of people really estimate the utility of such feature, so if your website or application handles long numbers that nobody would like to read completely, just show them an abreviature. In this article, we'll show you 2 implementations to generate the abbreviation of a number with PHP. // Remove unecessary zeroes after decimal. 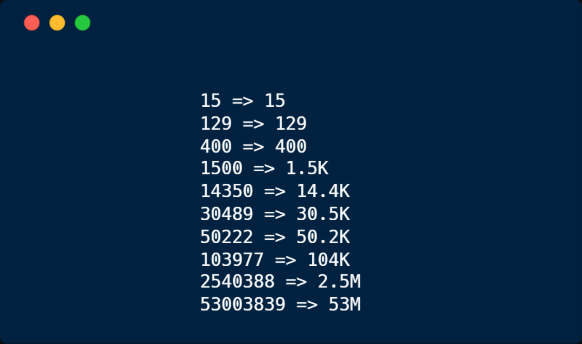 "1.0" -> "1"; "1.00" -> "1"
// Intentionally does not affect partials, eg "1.50" -> "1.50"
This implementation uses the number_format function, which formats a number with grouped thousands. * Function that converts a numeric value into an abbreviation.